Last week at GPU Technology Conference, Nvidia has revealed the a new Nvidia Metropolis intelligent video analytics platform that aims to provide deep learning analytics to video streams produced from smart city applications. It promises to make cities smarter and safer and should eventually bring game-changing capabilities to other industries. Nvidia says that 50 partners have already signed on to the project. The system applies deep learning to video streams for applications such as traffic management, resource optimization and public safety. You can also review Nvidia other product at http://autoxpedia.com. The GPU Tech Conference is the right place to show off advancements and new technology in something like video analytics, as it has become the flagship event to showcase how GPUs can literally change the world by enabling AI to do some things smarter and faster than people. It is one thing to have cameras watching at all the times, but another altogether to do something useful with the giant stack of data they are producing day and night. Manpower costs sitting and watching it all unfeasible, but computers is taking advantage of AI and machine learning could. This lines up with the new direction the company has been pushing in for the last few years. Nvidia say the majority of data generated comes from videos, particularly comes from the cameras in public areas such as public transit and government property. By the end of 2020 the number of cameras on streets is expected to rise by one billion. More than 50 Nvidia AI city partner companies are already providing products and applications that use deep learning on GPUs, many of which will be on display last week at the GPU Technology Conference. Partner companies include Avigilon, Hanwha Techwin, Dahua, Hikvision and Milestone. It’s a big leap from identifying cats to identifying crimes. 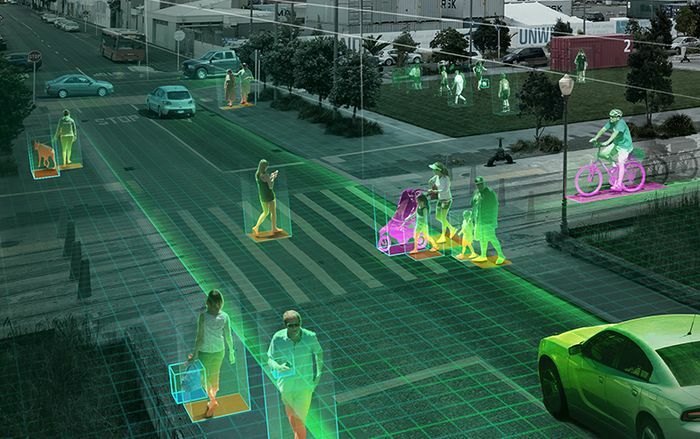 Nvidia says its chips are already tackling difficult AI challenges, like autonomous driving. Autonomous video surveillance could be next.